New strip! And there will be new strips every Monday and Wednesday! I’m so excited to be bringing Spacetrawler back, I’ve been more and more feeling I have more story to tell. And so it begins. You can still go to Spacetrawler.com, because, well, easy linkage, but it all brings you over to baldwinpage.com/spacetrawler where the strip is actually set up to run. I may get spacetrawler.com to work as well, but there were some roadblocks that didn’t get resolved in time for the release. I loved the original run and am so happy it’s back! it’s my favorite of all your stuff, and that’s praise. Excellent! The thing I think I really like the most is how many truly alien aliens you have 🙂 and now, yet another! How do you do it? What could a planet do that would affect the entire galaxy? Wake up and decide to be Unicron/Galactus/Remina? The thing I like the most is laughing twice a week. And on the rare occasions when your strip is not funny, it’s usualy moving. “Message From Dauthaar” kinda sounds like “Message from the author.” Are you trying to tell us something, Chris!?!? Are you in trouble??? Blink once for “yes”, twice for “no”! YES! I am so happy. Any reason that clicking on the “Previous” button on this strip plops you into a seemingly random place in the middle of the original Spacetrawler saga? @Seymour…. um.. huh. Let me look into that. Weird. Well, if I can’t have Vampire Bicycle back, I guess this’ll have to do. But seriously (although I did love Vampire Bicycle), —Wooooo!!! How much time has elapsed? Is Dimitri’s half-Eeb daughter all grown? It’ll be hard to top Dimitri, the single best character ever to grace a webcomic, but I suspect she might be the one to do it. Will there be new humans characters? Are there even some humans left somewhere? — Oh, sorry, wrong story. Oh! Cool! So maybe the Ghost of Martina Past will visit Nogg to tell him that his uncle murdered his father so his uncle could marry his mother. And to show Nogg that she still rocks her fashion sense. So I guess this is an uncontacted race (if they don’t know of other life in the galaxy) but not an unknown once (if Nob’s translator can understand their language.) Funny, if they’re already spacefaring in a big way. What’s the qualification for being contacted, again? Which I think was further defined, something about getting out of one’s own solar system, but can’t find the specific strip. Thanks! So they probably just haven’t worked out interstellar travel, which is understandable — you’d either need generation ships or FTL travel. I think back to reading Iain M. Banks’ “Against a Dark Background”, where the setting is a star system that is very isolated from the rest of the galaxy, such that the civilization that arises has never managed to get out of their own system despite having very powerful technology and perfectly good interplanetary travel — civilization rises and falls, but it’s all confined to this little fishbowl. This isolation is part of the psychological backdrop of a fairly dark book. Yes yes yes yes yes! I’ve missed Nog and crew. Also — “Lorkin’s nubs” is the best nonsense exclamation I’ve seen in years. Who was Lorkin and WHAT HAPPENED TO HIS/HER NUBS?? We need to know. Heck, I didn’t even know about this comment function is was not labeled. Otherwise glad to get back in the Space Trawler universe with your splendid work. I started here at the original Space Trawler just after you had started it. What a read that was. Thanx Christopher Baldwin for letting us read your work!!! FTL travel does make it easier to get around. Even better that they have control of the time dilation effect. That way we don’t have introductions of new people all of the time. Can you imagine how often the worlds would change if they aged 250 Terran years or more per world they visited? That would be confusing to say the least. 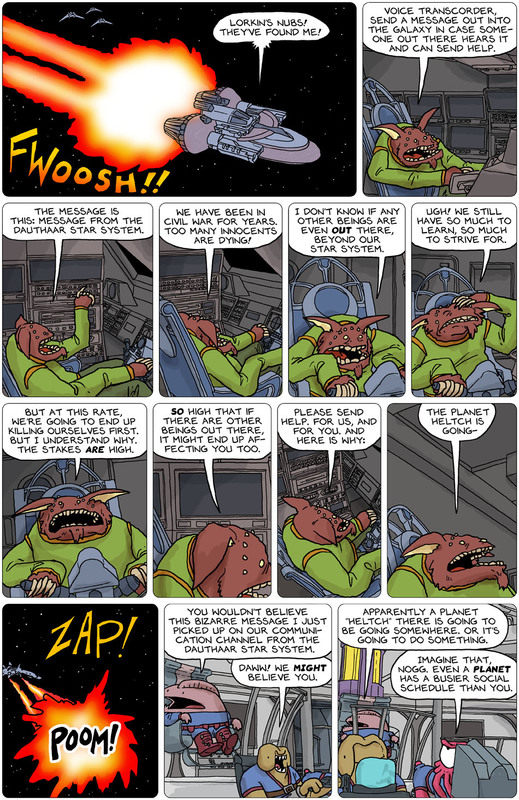 Just discovered the old Spacetrawler series a couple of days back and read them through (along with many of the comments). So I obviously knew about this new series that I’m just starting. I loved loved LOVED the old story and know I’ll love this one just as much. But I’m going to pace myself and only read a batch of strips once a week so I don’t catch up too fast. Or at least that’s my plan but then when I buy chocolate to pace myself, I eat it all at one sitting. Spacetrawler is far more addictive than chocolate! To be honest, I’m not young and so I wasn’t aware that there were that many web comics out that fit both sci-fi and humour. Red Dwarf and Farscape were my all-time favourites TV sci-fi shows. Spacetrawler has much of the humour I saw on Red Dwarf along with the complex story development of Farscape. Just posted to let you know how VERY much I love Spacetrawler and if you never see a comment from me again, it’s not because I feel out of love with it. I’m just not someone who comments much. 2. In your list of web comic links, I noticed you didn’t have Breaking Cat News. As a cat lover, you must’ve heard of it. If not, get over there immediately and start reading! I’d read some web comics off and on before but hers is the first I ever started reading regularly. I can’t praise it enough. Drive by Dave Kellet was the second regular read, and where I discovered Spacetrawler from you guest strips (which I considered on part with Dave’s Drive – high praise indeed! Not home, on my phone, so, super brief. I haven’t heard of either, I’ll check them out! The “previous” link on this page is broken. And wow I’m glad I decided to check in, More spacetrawler to binge after so long gone. I can’t believe it’s back and I didn’t know! I decided to see if I could read the archives after a scotch in my commemorative glass, and now I’m going to be up all night catching up!